If you have a year after the wedding to send thank you cards, I suppose it would also be fair to say you have at least a year to create your photo album. I finally took some time this weekend to arrange the photos that I had printed within a day of receiving the files from our photographer back in October. Half the work was done for me before the wedding even began, so it actually came together quickly once I got started. 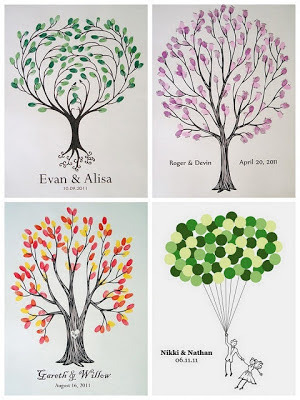 I had been struggling coming up with an idea for a guestbook - we knew we didn't want the traditional "sign your name" book, I wasn't sure that the create-your-own photo frame was for us and, while a cute idea, the idea of leaving my guests with inky fingers after putting their thumbprints on a canvas wasn't one I wanted to pursue. I have kept scrapbooks since kindergarten in one form or another. Since freshman year of college, my books have been born out of spiral bound, black-paged albums. Heavy on photos and captions, as opposed to a lot of typical scrapbook fare (read: overly designed), these have helped me toe the line between photo album and memory book. Read more about my scrapbooks in this post. The thought to combine the photo album and guest book came easily enough, but the idea of how to execute took a bit longer. I figured I could fill up the pages with blank spaces for guests to write their thoughts and well wishes, but without pictures in their places, would folks understand the intention? The next idea was to include placeholder images of the events that would eventually fill the book - getting ready, walking down the aisle, bridal party shots, dancing it up, etc. Google searching for appropriate clip art images proved fruitless: I would find one image I liked, but knew there wouldn't be one design that captured every wedding event I wanted on paper. One day I made an off-hand remark to my bridesmaid, Kara, via email when she inquired if there was anything she could do to help the planning: "can you draw stick figures?" I was more than excited when she responded, "YES! I'm actually great at stick figures!" I gave her a few scenarios to try out with a sharpie and cardstock and was so impressed when she texted over some starter images. Amazing detail, stick people that actually resembled us and cartoon versions of our wedding decor! 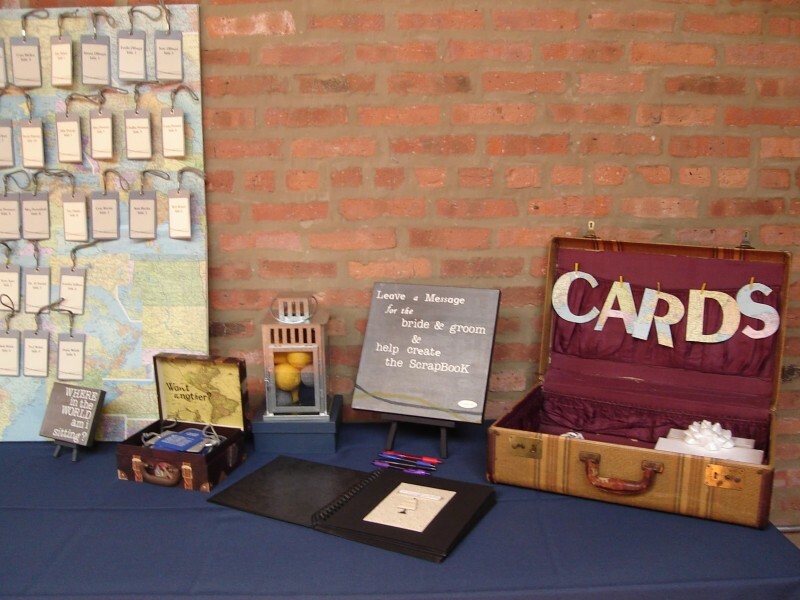 Can you spot our lantern centerpieces and vintage suitcase card box? Kara shipped me about 20 pieces, with several "photo to come" placeholders to help fill the book. I then got to work on printing different shapes and sizes on label paper to invite guest comments. After much layout trial and error, and what seemed like hundreds of photo corners and glue dots, the book had come together with the help of scrapbook paper and a few stickers. The drawings were affixed only with photo corners to allow for easy removal. The first few pages include photos from the proposal, our Save the Date, engagement session photos and our invitation to help set the stage. We also dedicated two pages to the program, back and front. The guestbook served its purpose the day of, with a stack of different colored pens available for easy writing and to add some splash to the book. Instead of adding any text to the front cover (somehow the ransom note magazine letters I use for my other books didn't seem appropriate), the first page of the book featured a 3D sticker of a wedding cake on scrapbook paper with the phrase "To Have and To Hold" above it. 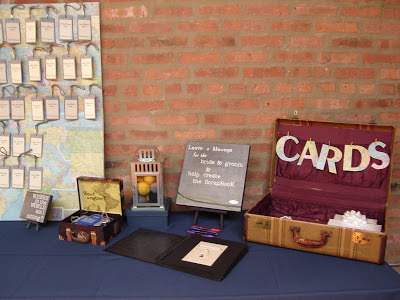 Fast forward to this past weekend, the stick figures all got taken out of their photo corners and added to a memory box, along with cards received, DVDs of the wedding day and more memorabilia. Sifting through about 250 photos, I picked out the top ones from every aspect of the wedding day. I plan on buying a more traditional photo album to house all of the rest. Again, layout proved challenging as my original assumptions on how many vertical photos I would get were quite wrong. Almost all of the photos I loved were horizontal, which changed how I used the placeholder spots since I wanted things to stay in chronological order. I removed all of the photo corners with the intention of re-using them with the help of some glue dots to re-ignite the stickiness. I covered any rips in the scrapbook paper from the stuck on corners. I also made sure to cover up any unused text boxes so it didn't look unfinished. Our wedding details got a couple pages of their own. The hotel suite we had booked for the night wasn't ready in time for the photographers to use for their detail shots, so instead they grabbed our rings, my dress and the flowers and sped off in search of creative areas in the hotel to feature the items. They laid flowers in hallways and up against windows, my shoes were hung up on a hallway light fixture, our rings were captured on a tabletop surface - I loved everything they came up with! Sticker sets from Michaels came in handy to help narrate the events, which got me off the hook in writing out the text myself and messing things up with my third grade handwriting. After a few hours the job was done and our wedding album can be considered complete, in time for that one year anniversary!